We know as guys that when it comes to wedding planning, sometimes you just get lost in the shuffle... That's why we created Groom Night - A guy-friendly night of wedding planning like no other! With vendors centered around what guys are interested in most, you and your fiance can knock out some of your wedding planning to-do's in a fun and manly way! From honeymoon planning and photography to entertainment and sweet treats, you'll get to experience some of Nashville's best wedding vendors first-hand! 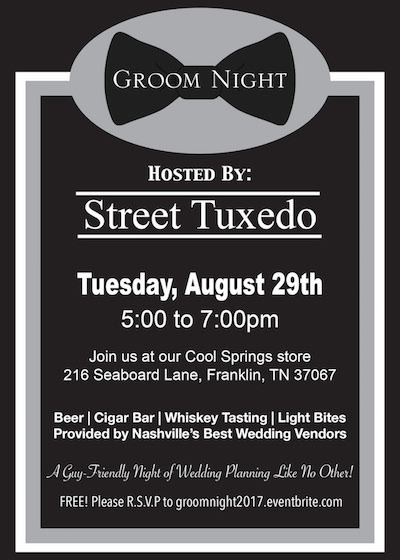 Our 5th Annual Groom Night will be on Tuesday, August 29th from 5:00 to 7:00 pm at our Cool Springs store. It's free to attend, so all we need is your RSVP! Click here to reserve your spot today!